The construction and further use of reservoirs have become a leading factor of alien species introduction and distribution in the Ob-Irtysh basin. In the Novosibirsk Reservoir, the fauna of alien species is represented by five species, three of which (Gmelinoides fasciatus Steb., Micruropus possolskii Sowinsky and Neomysis intermedia (Czerniavsky)) were deliberately introduced to increase the reservoir's forage base, whereas the rest two (Viviparus viviparus (L.) and Astacus leptodactylus Eschscholtz) appeared as a result of unintentional introductions. The history of penetration and naturalization of each species was traced, the ecological factors of their habitation were analyzed, and their current spatial distribution were studied. Despite low species richness, the alien species dominate in the formation of the bottom communities of the reservoir. Alexevnina, M. S., Presnova, E. V. (2008). Changes in the bottom communities of the Votkinsk reservoir during its existence (1962–2006). Current state of aquatic bioresources. 272–273 (in Russian). Babushkin, E. S., Vinarsky, M. V. (2017). The first discovery of the river Viviparus viviparus in the river Tura (Tyumen region). Fauna of the Urals and Siberia, 1. 19–24 (in Russian). Bakanov, A. I. (2005). Benthos of the Cheboksary reservoir: current state and spatial structure. Inland waters biology, 4. 50–66 (in Russian). Barbashova M.A., Malyavin, S.A., Kurashov, E.A. (2013). The discovery of the Baikal Amphipoda Micruropus possolskii Sowinsky, 1915 (Amphipoda, Crustacea) in lake Ladoga. Russian Journal of Biological Invasions, 3. 16–23 (in Russian). Basova, N.V. (2002). The Baikal amphipod Gmelinoides fasciatus (Stebb.) in the lake Gusinoe (Buryatia) and its distribution in the waters of Eastern Siberia. Ecological, physiological and parasitological studies of freshwater amphipods. 18–26 (in Russian). Bazikalova, A.I. (1962). Taxonomy, ecology and distribution of genera Micruropus Stebbing and Pseudomicruropus Nov.gen. (Amphipoda; Gammaridea). Taxonomy and ecology of crustaceans of Baikal. 3–140 (in Russian). Beckman (1962). Ecology and production of Micruropus possolskii Sow and Gmelinoides fasciatus Stebb. Taxonomy and ecology of crustaceans of Baikal. Proceedings of the Limnological Institute of the USSR Academy of Sciences. 141–155 (in Russian). Bedova, P.V. (2010). Population status of the river snail Viviparus viviparus L. (Mollusca, Gastropoda) of the river Malaya Kokshaga. Journal of Siberian Federal University, 3. 335–341 (in Russian). Berezina, N.A. (2007). Invasions of alien amphipods (Amphipoda: Gammaridea) in aquatic ecosystems of North–Western Russia: pathways and consequences. Hydrobiologia, 590 (1). 15–29. Berezina, N.A. (2009). Inter-species relationship between amphipod Gammarus lacustris and Gmelinoides fasciatus. Ecology, 2. 91–95. (in Russian). Berezina, N.A., Strelnikova, A.P. (2010). The role of the introduced amphipod Gmelinoides fasciatus and native amphipods as fish food in two large–scale north–western Russian inland water bodies. : Lake Ladoga and Rybinsk Reservoir. Journal of Applied Ichthyology, 26. 89–95. Berezkina, G.V., Arakelova, E.S. (2010). Life cycles and growth of some crests (Gastropoda: Pectinibranchia) in the reservoirs of the European part of Russia. Proceedings of the Zoological Institute of RAS, 314 (1). 80–92 (in Russian). Biological invasions in aquatic and terrestrial ecosystems. (2004). Moscow. KMK (in Russian). Ecology of fish in the Ob-Irtysh basin. (2006). Moscow: KMK (in Russian). Filinova, E.I. (2012). Baikalian gammarids in Iriklinsky reservoir. Current issues in the study of crustaceans of continental waters. Kostroma: Kostroma printing house. 301–303 (in Russian). Hanazato, T.A. (1990). comparison between predation effects on zooplankton communities by Neomysis and Chaoborus. Hydrobiologia, 198 (1). 33–40. Hubenov, Z. (2007). Fauna and zoogeography of Marine, freshwater and marine Mollusks (Molluska) in Bulgaria. Biogeography and ecology of Bulgaria. Dordrecht: Springer. 141–198. Interesova, E.E. (2016). Alien fish species in the Ob basin. Russian Journal of Biological Invasions, 1. 83–100 (in Russian). Istomina, M.M. (2008). Community structure of the Kama reservoir. Current state of aquatic bioresources. 107–110 (in Russian). Jakubik, B. (2006). Reproductive pattern of Viviparus viviparus (Linneus) (Gastropoda, Viviparidae) from littoral aggregations in a through flow reservoir (Central Poland). Pol. J. Ecol., 54 (1). 39–55. Jakubik, B. (2009). Food and feeding of Viviparus viviparus L. (Gastropoda) in dam reservoir and river habitat. Polish Journal of Ecology, 57 (2). 321–330. Jeżewski, W. (2004). Occurrence of Digenea (Trematoda) in two Viviparus species from lakes, rivers and a dam reservoir. Helminthologia, 41. 147–150. Kangur, K., Kumari, M., Haldna, M.(2010). Consequences of introducing the invasive amphipod Gmelinoides fasciatusinto large shallow Lake Peipsi: present distribution and possible effects on fish food. Journal of Applied Ichthyology, 26 (2). 81–88. Kestrup, A.M, Jaimie, T.A.D., Ricciardi, A. (2011). Interactions between invasive and native crustaceans: differential functional responses of intraguild predators towards juvenile hetero–specifics. Biological Invasions, 13. 731–737. Khlus L.N., Alergus, M.G. (2014). Intra-population variability of Viviparus viviparus (Gastropoda: Vivipariformes) in the foothills of Crimea. Bulletin of the IGPI P.P. Ershov, 4 (16). 105–110 (in Russian). Kirichenko, O.I., Anuarbek, S.M. (2016). 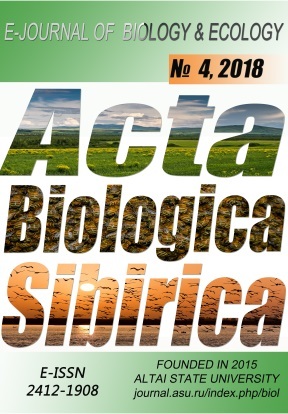 The state of biodiversity of the Irtysh basin and the impact of alien species on the ecosystem. Eurasian Union of scientists. Biological Sciences, 4 (25). 112–116 (in Russian). Korlyakov, K., Nokhrin, D. (2014). Trends in the emergence of the Volga–Ob invasive corridor. Bulletin of the young scientists and specialists of the Chelyabinsk region. 19–38 (in Russian). Kudersky, L. (1986). Ecosystems of reservoirs as an independent type of aquatic ecosystems. V Congress of VGBO. Kuibyshev. 84–85 (in Russian). Kurashov E.A., Barbashova M.A., Barkov D.V., Rusanov A.G., Lavrova, M.S. (2012). Invasive amphipods as a factor of transformation of lake Ladoga ecosystem. Russian Journal of Biological Invasions, 2. 87–104 (in Russian). Long-term dynamics of water-ecological regime of the Novosibirsk reservoir. (2014). Novosibirsk: publishing house of SB RAS (in Russian). Maslyakov, V. (2000). Ecological and geographical features of invasions of introduced species on the territory of Russia. Moscow (in Russian). Mauchline, J., Murano, M. (1977). World list of Mysidacea, Crustacea. Journal of the Tokyo University of Fisheries, 64. 39–88. Misharev, I. (1960). Acclimatization of fish and invertebrates from 1948 to 1958. Proceedings of the all-Union research Institute of marine fisheries and Oceanography, XLIII. 66–75 (in Russian). Monakov, A.V. (1998). Nutrition of freshwater invertebrates. Moscow: The Problems of ecology and evolution of RAS. A. N. Severtsov (in Russian). Muller, H.G. (1993). World catalogue and bibliography of the recent Mysidacea. Pankova, E.S., Berezina, N.A. (2007).Predation rate and size selectivity of the invasive amphipod Gmelinoides fasciatus preying upon the native isopod Asselus aquaticus. Acta Zoologica Lituanica, 17 (2). 144–150. Panov, V.E. (1996). Establishment of the Baikalian endemic amphipod Gmelinoides fasciatus Stebb. in Lake Ladoga. Hydrobiologia, 322 (1–3). 187–192. Popov, P.A., Viser, A.M., Upadyshev, E.E. (2000). Fish of the Novosibirsk reservoir. Siberian Journal of Ecology, 7 (2). 177–186 (in Russian). Rumyantsev, I.S. (2008). Problems of hydraulic engineering construction in Russia. Environmental engineering, 1. 12–17 (in Russian). Selezneva, M.V. (2005). Assessment of the current ecological state of the Novosibirsk reservoir by structural and functional indicators of macrozoobenthos communities. Novosibirsk (in Russian). Stohlgren, T.J., Schnase, J.L. (2006). Risk analysis for biological hazards: What We Need to Know about Invasive Species. Risk Analysis, 26 (1). 163–173. Succession of biocenoses of Bukhtarma reservoir. (2009). Bazhenova O.P. Omsk: publishing house of Omsk state University (in Russian). Toda, H., Nishizawa, S., Takahashi, M., Ichimura, S. (1983). Temperature control on the post–embryonic growth of Neomysis intermedia Czerniawsky in a hypereutrophic temperate lake. Journal of Plankton Research, 5 (3). 377–392. Toda, H., Wada, E. (1990). Use of 15N/14N rations to evaluate the food source of the mysid, Neomysis intermedia Czerniawsky, in a eutrophic lake in Japan. Hydrobiologia, 194 (1). 85–90. Viser, A.M. (1981). The results of introduction of the Baikal gammarids communities in Novosibirsk reservoir. Fish farming, 4. 47–48 (in Russian). Viser, A.M. (2006). Acclimatization of Baikal gammarids communities and far East mysid in the Novosibirsk reservoir. Tomsk (in Russian). Viser, A.M. (2010). The role of the Baikal amphipod Micruropus possolskii Sow. in the ecosystem of the Upper Ob. Ecology of aquatic invertebrates. Yaroslavl: Printchar. 65–66 (in Russian). Viser, A.M. (2011). The zoobenthos dried zone of the Novosibirsk reservoir. Contemporary problems of ecology, 12 (1). 69–75 (in Russian). Viser, A.M., Viser, L.S. (2016). Modern distribution and ecology of invasive species of the mollusk Viviparus in the upper Ob water ecosystems of Siberia and prospects of their use. Tomsk. 28–31 (in Russian). Yanygina, L.V. (2011). The current state and long-term changes of zoobenthos in the Novosibirsk Reservoir. Inland Water Biology, 4 (2) 218–222 (in Russian). Yanygina, L.V. (2012). The Role of Viviparus viviparus (L.) (Gastropoda, Viviparidae) in Formation of Macrozoobenthos Communities in the Novosibirsk Reservoir. Russian Journal of Biological Invasions, 3(1) 64–70. Yanygina, LV. (2017). Pathways of macroinvertebrate invasions in the Ob River basin (West Siberia). Limnology, 18. 243–249. Zhadin, V.I. (1952). Mollusks of fresh and brackish waters of the USSR. Moscow (in Russian).